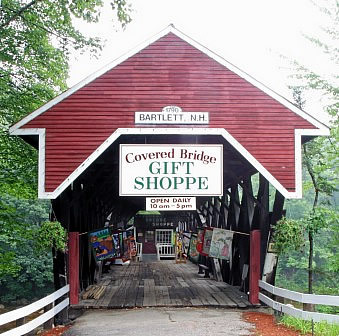 The historic Bartlett Covered Bridge, which spans the Saco River, is one of only 53 covered bridges left in New Hampshire. Built in 1850, the bridge is 183 feet long with single span, paddleford type construction. The span was strengthened for vehicular traffic by the addition of a pair of laminated wooden arches in the 1920’s. This bridge carried traffic travelling on Route 302 over the Saco River for more than 80 years until it was replaced by the steel bridge in 1939. In 1965, the bridge and the land around it were sold to Mrs. Isabelle Casinelli who lived in this inn when it was a private residence. She had the 12′ x 80′ gift shop built inside the bridge. We are the fourth owners of this historical property and plan to maintain the condition of the bridge for future generations to enjoy. 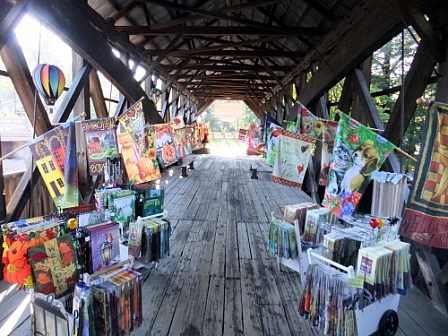 The Covered Bridge Shoppe is a truly unique gift shop located inside the Bartlett Covered Bridge. But there’s more to our shoppe than just a great location. We feature a distinctive collection of country home decor items including candles and accessories, throws, pillows, wall art and pottery, chimes, plush animals and a very large selection of flags, all at reasonable prices in a friendly atmosphere. In addition, we offer a full line of souvenirs including a great selection of T-shirts and many covered bridge items ranging from prints and ornaments to mugs and earrings. 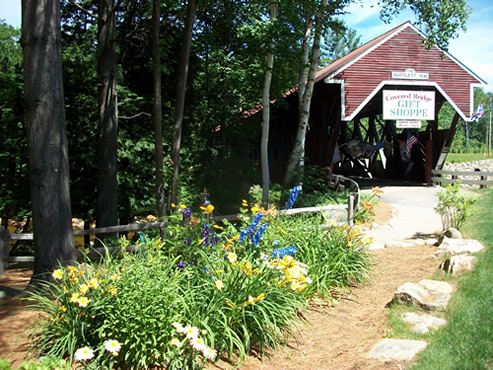 Since 1965, the Covered Bridge Shoppe has been a favorite stop for travelers in our valley. While on vacation in the beautiful White Mountains, or if you’re lucky enough to call New Hampshire home, be sure to stop by and visit us. Our shoppe is open daily from 10am to 5pm, Memorial Day Weekend through October. We are also open the second weekend of December for some Holiday shopping.